There will be clear and bright skies over the city today with cool temperatures. Today’s high will reach 47° with the low tonight 34°. Eight musicians have been dismissed from the Philadelphia Orchestra because they are aliens from one of the Central Powers. The Orchestra is holding music tests at the Academy for replacements. Two thousand policemen of this city have threatened to go on strike at midnight on December 31st if their demands are not met. The group comprises two-thirds of the force. Officials of the Patrolmen’s Benevolent and Protective Association presented the demands to Director Wilson today on behalf of the men. The demands include: removal of the police from politics; abolition of political assessments; abolition of station house assessments; policemen to elect their own delegates to the pension fund; public accounting of the pension fund; increases in policemen’s salary to $1,400.00 per year and $1,600.00 for sergeants; public hearings for policemen charged with misconduct; and abolition of the “ginks” squad (police spies). In business news, C. Schmidt & Sons Brewing Company has filed suit against the Internal Revenue collector, Ephraim Lederer, for recovery of $882.26 paid in taxes. The company asserts that the tax, which was assessed from 1909 to 1914, was improperly collected because it was laid on beer given away as Christmas presents to customers, not sold to them. In sports news, Walter Anderson, left handed pitcher for the A’s has joined the army. The other Mackmen who have joined the colors are third baseman Ray Bates, pitchers Socks Seibold, Win Noyes and Rollie Naylor and outfielder Ralph Sharman. 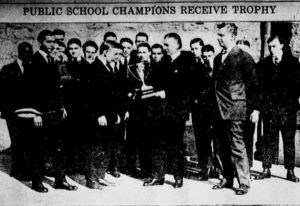 And this year’s football championship team from Northeast High School was presented with the Gimbel Cup today (shown below). The boys were given the cup by Mr. Ellis Gimbel at a ceremony at the school. Reports have been received from Sweden that a preliminary armistice between Germany and Russia has been agreed to. Negotiations for a permanent armistice are ongoing. A cease fire has already been declared on the Pripet-Lipa front. Also a Republic has been declared in Siberia and all Siberian troops are being recalled from the front.